The Writing Life: What Is Your Postcard Strategy? What Is Your Postcard Strategy? Editor’s Note: I’ve written about postcards and the importance of them for every author. I’m bringing you this excerpt to help you learn more about postcard marketing. There is much greater detail in the Postcard Marketing Handbook. Allow me to save you a lot of heartache and disappointment by saying right now, don’t bother with postcard marketing if you only plan to do a single-step campaign. In fact, don’t bother with marketing at all. I can’t tell you how many business professionals I’ve encountered who decide postcards, sales letters, TV commercials, coupons, advertisements or anything else you can think of doesn’t work in their market because they didn’t get the results they wanted after a single-step campaign. Now, I’m not saying you shouldn’t expect to get decent results on your first postcard mailing. If you follow ALL of the advice in this book, you will. But I am saying if you’re thinking, “All I have to do to sell 1,000 widgets is send out A postcard,” you might want to rethink your marketing strategy. Why? Because the more mailings you send a prospect and the more mediums you use to communicate your message, the more likely you are to enjoy a successful campaign. Remember, POSTCARDS ARE NOT MIRACLE WORKERS. If all it took was one mailing to make all the people you desire buy or do what you wanted, there wouldn’t be much need for regular, consistent marketing much less multi-media marketing would there? So, if you haven’t already, sit down and plan out your marketing strategy. Figure out how many different ways you can communicate with your audience and how many times you can afford to touch them over a given period of time. Only then should you proceed with designing, writing and sending your postcard mailing. Let me also say that if you are on a strict budget, postcards are an excellent low-cost option for multi-part mailings because of the low cost per thousand. How? By tweaking the message you already have then re-mailing. Yes, it’s important to touch your prospects multiple times and in multiple ways but that doesn’t mean you have to create a new message from scratch every single time. On the contrary, once you find a message that works (through testing which we’ll discuss later), you’ll want to use it over and over again. Now perhaps each piece will have a different headline, different proof points or feature a different benefit, but the USP and overall message should remain largely the same. After all, it is a series mailing and each piece should be related to the previous and subsequent ones. Second only to the single-mailing mistake, the worst mistake I see marketers make is trying to use a little-bitty postcard to move mountains. What do I mean? Simply that it’s not reasonable to expect a 3.5” x 5” or even a 6” x 9” postcard to sell expensive products and services. There just isn’t enough room on a postcard to persuade someone to fork over thousands or even hundreds of dollars for your product or service. That’s what long sales letters, teleseminars and other marketing mediums are used for. Instead, your strategy should be to graduate your prospect to the next step in your sales funnel by getting them to call in, write in or fax in their request for a free or low-cost book, special report, teleseminar, CD or some other item with a high perceived value. Of course you can sell low-cost items quite effectively with postcards, but if that’s not your market, you’ll want to use the approach described above. Remember, the trick is to get your prospects in the habit of saying “yes” to you by making it easy, not by requiring an act of congress to pass a budget amendment. Got it? About the Author: Lina Penalosa is a marketing consultant, expert copywriter and professional speaker. Her specialties include the art of the soft-sell, teaching others to write results-generating copy with integrity and purpose, and marketing to women. 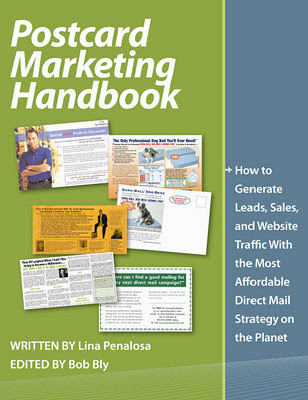 Excerpted from the Postcard Marketing Handbook, How to Generate Leads, Sales, and Web Site Traffic With the Most Affordable Direct Mail Strategy on the Planet, used with permission.